Catch Surf Beater, it's sit amoungst the favourite of Catch Surf board. 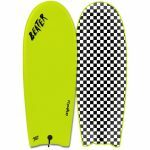 The Catch Surf Beater is one of our top sellers of the Catch Surf Surfboards. There is a reason behind this. 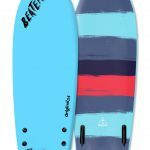 The board features a strong, light-weight and water-resistant core with dual (x2) maple-ply wood stringers and high density bottom to make it the stiffest most durable Beater ever made! 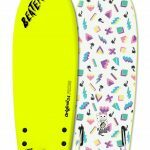 This board is absolutely perfect for those onshore summer shore break days… in fact, it is perfect for any dam day! It can be completely finless! 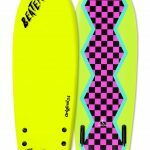 The tapered D-rails and twin-channel crescent tail is ideal for finless performance. 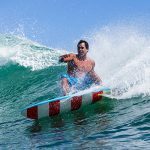 It allows you to hold a rail in the pit or when you are doing one of those full open–faced carves that get you talking about it for days on end! Personally going finless is my favourite, especially on those 4ft summer Glen Ashley shore breaks. There is nothing better than paddling into a bomb, knowing you are probably not going to make it out, but knowing that neither you nor the board is going to get broken! EPIC SUMMER BEACH DAYS… THE BEATER IS ALL ABOUT FUN! Created by the crazy humans at Catch Surf, the Beater original is destined to take over the world. It is the original all-purpose, fully customisable shred stick! Surf it with or without fins, bodyboard or skim it; do whatever the f%#k you want. The Beater will turn an average beach day into an Epic Tale of Radness! Fun for all skill levels and can take a Beating!